Region: Central and Southern part of Mongolia. 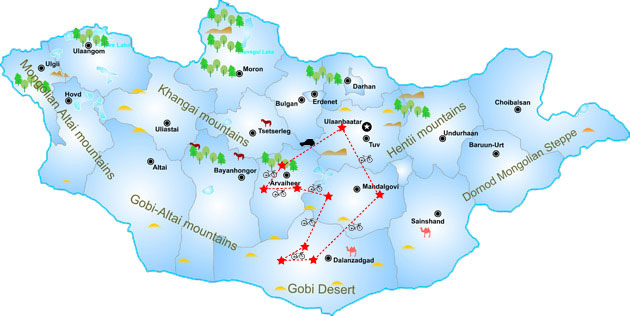 This exciting trail in the southern and central provinces of South Gobi and Karakorum, passes through varied and beautiful landscapes with wide fertile valleys, forests of silver birch and poplar, rivers and mountain passes. There are a few villages along the way, but most of the population are nomadic and live in the traditional round white gers. Depending on how much rain has fallen, wild flowers may be abundant, and there is a good chance of seeing eagles, cranes, vultures, partridge, falcons and other interesting birds along the way. The trail is classed as moderate, requiring some technical skill to manage the steep rocky passes. The first couple of days are on hard packed mud tracks through valleys between the mountains. If there is much rain, the surface may be slippery and more difficult. Riding through the forests and over mountains on rocky tracks sometimes blocked by fallen trees will be quite challenging. The daily riding distance is between 40km - 80km, depending on the terrain. Erdenezuu monastery was built by AvtaiSain Khan on the ruin of the Mongolian capital Karakorum in 1586. It was the first great Buddhist Monastery of Mongolia. It is part of the World Heritage Site entitled Orkhon Valley Cultural Landscape. Stones from the ruins of Karakorum were used in construction. It is surrounded by a wall featuring 108 stupas, 108 being a sacred number in Buddhism, and the number of beads in a Buddhist rosary. The monastery was damaged by warfare in the 1680s, but was rebuilt in the 18th century and by 1872 had a full 62 temples inside. The ErdeneZuu Monastery was taken to state protection and became museum in 1944. Drive back to Ulaanbaatar. Transfer to the hotel and lunch at the finest restaurant in Ulaanbaatar. In the afternoon free time do shopping for cashmere shop, souvenir shop and State Department Store. Enjoy watch national folklore performance by “TumenEkh” national song, throat singing, tsam mask dance and so on. A farewell dinner and stay overnight in hotel. Transfer to the “Chinggis Khan” InternationalAirport or Ulaanbaatar Train Station for departure.